MM&FF Takes A Look At A Modular-Power Recipe, As Prescribed By The Doctor Of Mod Motors, Boss 330 Racing's Al Papitto. 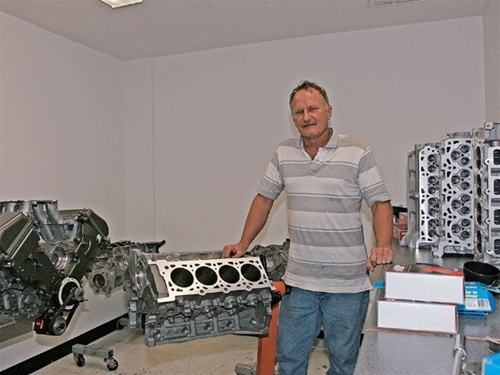 It was Cermin's GT, in fact, that brought us to Boss 330's Vero Beach, Florida, location to check out what exactly went into one of these potent engines. We also spent the majority of our time questioning Papitto about modular engines and his extensive experience with them. But first, the motor. This is the stock Ford GT block out of Joe Cermin's 1,000-plus rear-wheel-horsepower twin-turbo Ford GT. You may have caught the full feature on the car in the Feb. '07 issue of MM&FF. Currently there's a Boss 330 motor bolted to the Ricardo transaxle, and Cermin had the original motor at the Boss 330 digs to duplicate the 5.5 mill that he's using right now. The GT blocks offer beefier sidewalls, billet main caps, and unfortunately, no provision for wet-sump oiling. Many builders, including Boss 330, have the block machined to accept a wet-sump pump so they can be used in non-GT applications. The GT blocks, however, have been discontinued by Ford, so jump on one if you can find it. The 5.5 modular powerplant is simply a 5.4 that has received a 0.020-inch overbore. The 5.5 mill that Boss 330 was assembling, though, wasn't as simple as that. It was, in fact, a duplicate of the engine that Cermin has already slung beneath the back hatch of his '05 Ford GT. While the market for GT owners is relatively small, the motor should be quite popular with the growing GT500 crowd, along with Lightning owners who have made the Four-Valve head swap. The only major hiccup to this is that GT blocks are no longer available from Ford, so you'll have to do some hunting to find one if you don't already have one. Our subject GT block was given a 0.020-inch overbore on all eight holes, and Boss 330 slips in its own rotating assembly that consists of a stock GT crank, Boss 330 forged connecting rods, and forged pistons. Despite the incredible power output and turbocharged nature of the engine combination, Papitto increases the compression ratio by decreasing the size of the dish in the piston. "The increase in compression ratio really wakes the engine up off boost," he says. Where the stock GT rods are an H-beam design, Boss 330 uses Manley's forged Pro Light I-beam design. "They're basically the same in strength," Papitto says, "however, our connecting rod uses ARP 71/416-inch rod bolts instead of the smaller, stock 31/48-inch 8740 fasteners." Also shown is the Boss 330/Mod Max piston, the stock Ford GT piston from Mahle, along with the stock wristpin, and the Boss 330 180-wall, tool steel wristpin. The next piece of the puzzle is the induc-tion, and here we start with the stock GT cylinder heads, which are then ported and polished by Kris Starnes. Papitto installs new valveguides and his own custom valves and valvesprings. He swaps out the stock single coil design for his own double-coil piece that offers more seat pressure. This is required as the camshafts that will be going into the motor are slightly more aggressive. If you want the specs, you'll have to talk with Papitto, but we doubt he'll tell you either. MM&FF: How did you get started building engines, and how long have you been doing it? Papitto: The pros of modular engines are that they're a modern design and, up to a point, are actually less expensive to build than a pushrod 5.0. It's no secret that the stock 5.0 blocks and cranks fall apart just past 500 hp. The modular engines can be pushed far beyond 500 hp using a production block, crank, and heads. Some examples are the supercharged Two-Valve pump-gas engine that makes 700 hp and the supercharged Three-Valves that make more than 800 hp with a cast stock crankshaft. The Three-Valve engine did fail after a year-it broke the nose off the stock cast crank due to the extreme loads put on the front of the crankshaft by the drivebelt spinning an F1R ProCharger. Another example of a Four-Valve is a turbo-charged 5.4 Navigator-based engine that put out more than 1,000 hp. All of these examples used stock Ford blocks, cranks, and cylinder-head castings. An extreme example is a twin-turbo 5.4 Ford GT that is street driven and puts out more than 1,400 hp. The overhead-cam design allows for a light and strong valvetrain. My own 5.4 has been running for two years at speeds over 8,800 rpm without any sort of valvetrain problem. The Four-Valve cylinder heads have great airflow potential to go along with the tough valvetrain. To get anywhere near these numbers with a 5.0 would just about require the engine to be totally built with aftermarket parts. The cons are at some point the production parts are not strong enough to make really big power numbers, and there are almost no aftermarket blocks, cranks and heads for the modular engines. Also, the modular engine series is displacement limited by its small bore centers. MM&FF: How did you come to specialize in modular engines? Papitto: After 20 years of drag racing motorcycles, including four years of Pro Stock Bike, I had a lot of experience with overhead cam, multivalve engines. When I stopped racing Pro Stock bikes, I started playing around with my '97 Cobra that I owned for about a year. The first modular engine that I built was a 5.4 Navigator-based engine-it produced over 420 hp on UPR's dyno. I had fun building that engine; the big Four-Valve heads had a strong resemblance to the Four-Valve Suzuki engines that I had raced for years. After that, the phone started ringing-people were interested in Four-Valve engines. I took the car to Dave King's Modular Shootout in Maryland, and it won the Four-Valve naturally aspirated class. I beat on that Navigator engine for over a year, and a failed oil pump eventually killed it. MM&FF: What are the most common misconceptions that people have regarding modular engines? Papitto: That the engines are weak and too complex. MM&FF: What are the weakest parts of the 4.6 and 5.4 engines, and at what power level do they become an issue? Papitto: The stock connecting rods, pistons and, in some cases, the stock oil pump. [Regard-ing the second part of your question], I would say around 450 hp. There are some cases where I've seen stock early Cobras make over 550 with no problems. The '03 and '04 Cobras, by virtue of having Manley H-beam rods and forged pistons, do quite well at 550 hp or so. Much beyond that level, the main caps on the two-bolt main iron block begin to move around enough to transfer metal from the caps to the block. MM&FF: Boring and stroking the modular motor-is one better than the other? Why? Papitto: The 4.6 stock has a fairly long stroke, and a good bit of the piston skirt comes out of the block at bottom dead center. Adding 0.200 inch of stroke pulls even more of the piston out of the block. In the case of the 5.4, the stock 4.165 stroke is long to begin with. This is one area where the small 3.572-inch bore is actually good. It makes for a light piston/wristpin assembly that lowers the tensile load on the connecting rod and rod bolts. It's common practice to use a 0.020-inch oversize piston, and this gives no problem. We have a few engines running around that are 0.040 inch oversize. In the case of the big bore, it requires resleeving the block to accommodate the 3.700-inch bore. This is made possible because the aluminum block has siamese-bore construction. The big-displacement engines won't show a large gain in power unless the heads/cams, intake, and exhaust system are modified to feed the larger displacement. MM&FF: What are the best blocks to use and why? Papitto: In the case of the 4.6, the OEM iron blocks are cheap, and they hold up well in limited-power applications. The early '92-'99 aluminum blocks (commonly known as the Teksid block) were cast in Italy and are regarded as the best of the 4.6 blocks. John Mihovetz has run 6.60s at over 210 mph using the production block. The later aluminum blocks, first cast in Canada and then in Mexico, are regarded as being less desirable than the early Teksid block, but I haven't had a problem with any of them. In either case, the aluminum blocks have the advantage by being 65 pounds lighter and having four-bolt main caps. In the case of the 5.4, you really only have two choices: the early iron block used from 1998 to 2002 and the NVH block. The early block weighs 189 pounds. The NVH block has more metal on the sides and in the main webbing and weighs about 205 pounds. The alternative is the aluminum block from the '05 Ford GT. These blocks have enormous strength, billet-steel main caps, and thick webbing everywhere. The Ford GT block weighs about 125 pounds. The drawback is they're expensive; there's no provision to use the standard modular-style oil pump as the Ford GT uses the dry-sump oil system with the external pump. The blocks were built in limited numbers and are becoming hard to find. MM&FF: What's the best setup: Two-Valve, Three-Valve, or Four-Valve? Papitto: Two-Valve engines can make good street engines with small superchargers, but they are rpm-limited by the lack of airflow. Three-Valve engines are prone to detonation caused by the spark plugs. There are only two choices for spark plugs, and they have a very hot heat range. They also have a weak spot in the cam phasers, which are not strong enough to deal with the increased loads associated with stronger-than-stock valvesprings. If you're looking for maximum modular power, the Four-Valve heads are where it's at. The efficient combustion chambers, big airflow, and lightweight valvetrain makes the Four-Valve heads the only choice for big power and high rpm. MM&FF: Do you see a lot of people looking at the 5.4 instead of the 4.6? Papitto: Not really. The 5.4 will physically bolt right in, but there are difficulties associated with the exhaust and intake manifolds. Sullivan Performance was the first and only company offering an aftermarket intake manifold. Its short runners work well with high-rpm or supercharged applications. MM&FF: How hard is it to drop in a 5.4 where a 4.6 used to be? Papitto: The 5.4 will bolt right in. Stock Cobra exhaust manifolds will clear the frame. I'm not aware of any aftermarket header that will work with a 5.4 and SN-95 chassis. The intake manifold presents a big problem. Sullivan Performance offers an intake manifold designed to work with Navigator heads and a 5.4 block. The Shelby GT500 manifold will only work with GT500 or Cobra R heads. MM&FF: Are you familiar with Steve Erickson's 5.4 swap kit and, if so, what are your thoughts on it? Papitto: Yes, I am. Steve has put a lot of effort toward making this work using all factory Ford parts. His swap is based around the Australian Falcon 5.4 intake manifold. This manifold has ports designed to work with the '03-'04 Four-Valve head.